Like most 3-year-olds, my son loves books and pictures of himself. So I knew that JibJab Jr. Books, an iPad app that lets me customize e-books with his name and face, had the potential be a huge hit. Of course custom books can get old quickly if the story line isn’t good, and that where JibJab Jr. Books shines. Like JibJab’s political satire videos (see This Land) and Sendables custom video cards (remember ElfYourself, or last year’s Elf Snowball Fight? ), the company’s first two children’s e-books are well written and funny. When you download the JibJab Jr. app (free on iTunes), you get The Biggest Pizza Ever for free. Additional titles are $7.99 a piece or you can subscribe to the JibJab Jr. Book of the Month Club for $3.99 per month. For now, the only other title available is The Alphabet Wrangler. 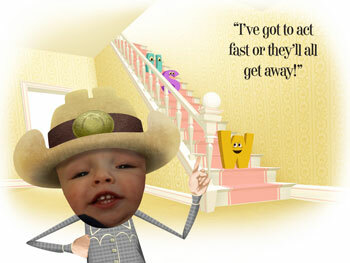 To customize a JibJab Jr. book, you add your child’s photo from your iPad’s photo library and type in his or her name. Once you’ve added a photo and name, it’s saved as a profile and you can reuse it in subsequent titles. You can also use multiple profiles with each book. The books aren’t narrated and don’t have interactive elements, but they do have great animations on each page, which help bring the story to life. My son was entranced as he watched an animated caricature of himself find and capture all of the letters in the alphabet in The Alphabet Wrangler.